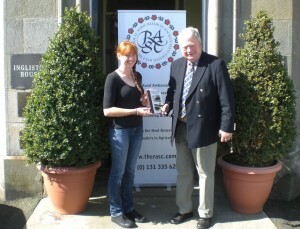 The photograph shows Amy Copland, from Kerang, Victoria, Australia, presenting a copy of the book “Around The Ring” to Andrew Gilmour, Honorary Treasurer of the Royal Agricultural Society of the Commonwealth, at Ingliston House, Edinburgh. The book was compiled by Ashlee Hammond, during the time she and Amy were at Kerang Technical High School (KTHS) in Victoria, Australia four years ago. This school runs an agricultural course, with a strong focus on beef cattle production, husbandry and showing. Alongside this course, a number of students undertook the Duke of Edinburgh’s Award, of which KTHS piloted ‘Beef Cattle Judging’ as a new skill in the Skill section of the Award. Both Ashlee and Amy completed their Silver Duke of Edinburgh’s Award. Ashlee did a bit extra for her Award by compiling this book on ring craft. Ring craft is the way in which a judge of any livestock manages the stock and stock handlers around a show ring whilst judging. Ashlee contacted judges of cattle from around the world and asked them to write down their individual ring craft routine and any key points when judging stock. The book is a fascinating read for budding judges! A beautifully presented hardcover book with over 20 international judge’s entries was produced. Copies of ‘Around the Ring’ have both been sold and donated to young people interested in the show scene, as well as practised judges, livestock breeders, people in our local community and some agricultural societies. Amy spent this summer in the UK, so Ashlee, along with our mentor, Bruce Anderson, asked if she may be able to present a copy to the Royal Agricultural Society of the Commonwealth. They thought it would be quite fitting that ‘Around the Ring’, a book of international nature, should be in the archives of a society that represents agriculture and all its facets the world over. Amy is very keen to attend the tour and conference in Brisbane in October, and there will be copies of the book available at Brisbane!